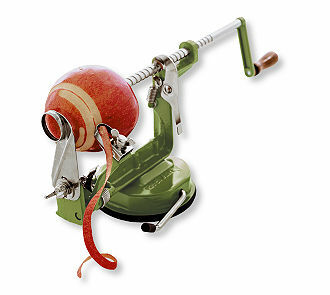 This is another of my favorite gizmo’s: I got this apple peeling gadget from L.L. Bean many years ago when I was first married. I get so many comments from people, especially kids, who come into my kitchen to visit. While it may seem ridiculous to have something that just peels apples, it is really useful for baking and as an added bonus, children tend to eat more apples. First, they eat the “apple spaghetti” which is the actually the peel (Where all the phtyo-nutrients are!) and then they eat the “apple accordian.” Here is a recipe that I adapted from Pie In The Sky by Susan Purdy. It is bursting with apples and it is so outstandingly delicious, you’ll end up making it once a month. Aspen Apple Cake will be all the justification you need to add a countertop peeler to your kitchen cache. Sift together the dry ingredients (reserving 2 Tbsp. of flour to toss with apples and dried cherries and nuts.). With an electric mixer beat together the eggs, sugar, oil, vanilla and milk. With mixer on low add dry ingredients, scraping down to make sure it all gets incorporated. Fold in the apples/cherry/nut mixture. Pour into a buttered and floured 9-10 inch tube pan and bake for 75 to 80 minutes. I made this one in a 9×13 pan and it baked for 55 minutes.